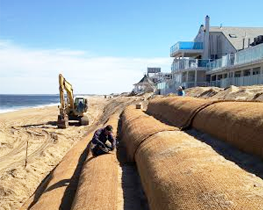 NETCO Coastal Construction division focuses on erosion control, soil stabilization and ground improvement in zones of high erosion potential. We offer a broad range of engineered construction techniques to help our clients reduce the potential for erosion losses in coastal zone and inland marine, stream, and riverbank environments. We work with our clients to fully understand their erosion, soil stabilization, or ground improvement issues. Only when we can completely define the problem will we offer suggestions on possible solutions (including required regulatory approvals). We enjoy close working relationships with many of the leading coastal engineering, geotechnical, environmental and permitting consultants in New England. These working relationships allow us to draw-in experience permitting personnel, highly experience technical consultants who can help us address not only erosion control management issues, but also non-erosion control permitting challenges, such as wetland delineation, coastal marine and wildlife habitat identification, endangered species studies (wildlife and flora/fauna), and ecological evaluations.